There is 1 review for 'Covenant of Solitude'. A bit after this game, Magitec came out with Chrome Wolf. By Kemco standards, it was almost shockingly mature, featuring friends torn apart by a rebellion against a nation’s empire. Covenant of Solitude feels like a trial run for that game. At times amateurish and clunky, one can still see the building blocks of a far better effort on display. The basic plot: A tragedy tears apart two friends when a girl they’re both pals with is killed by monsters. Fort, the protagonist, is a Genie, meaning he can summon monsters. Legna, his friend, is a more normal guy. Elicia, the girl they’re friends with is the one killed by monsters — summoned by Fort in an attempt to save their village from imperial forces. Fort is jailed and is to be executed by the empire for refusing to use his summoning powers to aid them in their war effort, but is able to escape, where he is enlisted by resistance leader Evans. Twists and turns abound, as Fort tries to figure out if he can actually trust anyone, whether they be friend or foe; while, meanwhile, Legna works his way up in the imperial hierarchy. Fort is the only human party member, while the other three slots are taken from four monster classes that correspond to typical character classes such as warrior, mage, healer and thief. Unfortunately, those are the only four classes — regardless of Fort’s powers, you’ll never be able to recruit monsters in battle or in post-fight dialogue. Overall, this is pretty standard “town to dungeon to next town” fare, but with some nice twists and turns that keep the story interesting. There is a pretty high level of challenge, particularly towards the end; however, Fort can enter an “internal world” at any time outside of battle where he can not only swap monsters in and out, but can also purchase items. Obviously, that blunts some of that difficulty when you basically carry a shop with you and, as long as you have money, can buy potions and other items at will. There also is a sort of laziness with some of the programming. The empire is simply called “Empire”, while the nation funding the resistance is called “Kingdom”. The world map is more a collection of islands and land masses connected by bridges than anything resembling an actual world. As per the norm from Magitec, the graphics and sound are inferior and more clunky than what Kemco’s other teams produce. I mean, the title screen music seems to start looping a few seconds after it starts. Still, while this game is average at best, it does show that Magitec had talent — it just wasn’t fully harnessed at this point. 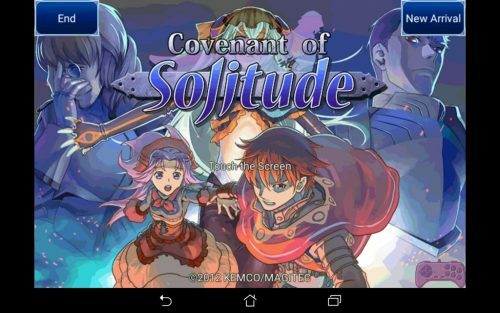 The story was decent and it was a bit tougher than most Kemco games to get through, so it was an okay time, I’d say. Fairly challenging to get through. You can't recruit monsters, even though Fort's powers indicate that; instead having to use pre-made templates for party members. Being able to buy items at nearly any time degrades that challenge a bit. Somewhat clunky and ugly by anything other than NES standars.